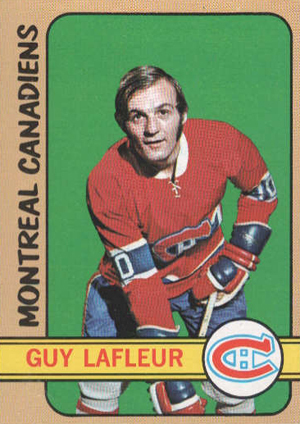 The NHL was in expansion mode for the 1972-73 season, and so was Topps. For the season, 1972-73 Topps Hockey expanded to 176 cards, which made it the largest hockey set the company had ever offered to that point. Card fronts featured a player picture superimposed over a solid-colored background. A yellow stripe running below the picture features the player's name and a team logo. The team name runs vertically up the left side of the card. The area around the picture is entirely tan, which is an unusual color choice that works well. A red stripe runs across the back at the top and gives the card number as well as the player's name and position. A separate red block at the left side contains vital stats and a cartoon about the player. A biography and year-by-year statistics fills out the remainder of the card. The set includes players from the first-year Atlanta Flames and New York Islanders. Cards 61-65 featured the league's top players in several statistical categories. All-Star players were named on cards 121-132. Cards 170-176 showed pictures of the NHL's various trophies. One checklist card was also included in the set. Since the full set was produced on two separate printing sheets, 88 of the cards were double-printed. This is one of my favorite sets with it’s colored backgrounds and tan borders. No major rookies are included but the set has many stars of the day. A solid effort.